We have 5 standard double rooms available here at Tudor Lodge. Now, we are the first to admit that they are not huge but, remember, Tudor Lodge is an old character building right in the centre of Porthmadog, and sometimes you simply have to work with what you've got. We would absolutely love to give you bigger rooms but we can't! Instead, we have put a lot of thought, much love and great attention to detail into the design of our rooms to make them really cozy and comfortable for you. If you step into one of our rooms and it feels like you are getting a good old hug, we have been successful in creating the right space for you. 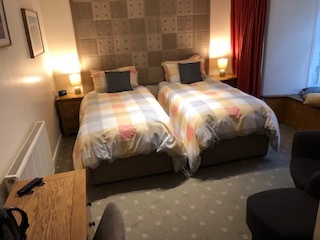 We have 2 standard twin rooms available here at Tudor Lodge. Both of the rooms are located on the first floor. 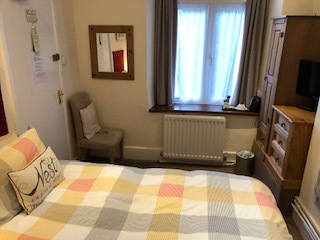 Like our standard double rooms, these are not huge but, remember, Tudor Lodge is an old character building right in the centre of Porthmadog, and sometimes you simply have to work with what you've got. We would absolutely love to give you bigger rooms but we can't! Instead, we have put a lot of thought, much love and great attention to detail into the design of our rooms to make them really cozy and comfortable for you. If you step into one of our rooms and it feels like you are getting a good old hug, we have been successful in creating the right space for you. Unfortunately, due to the layout of our property, we do not have any standard twin rooms on the ground floor. 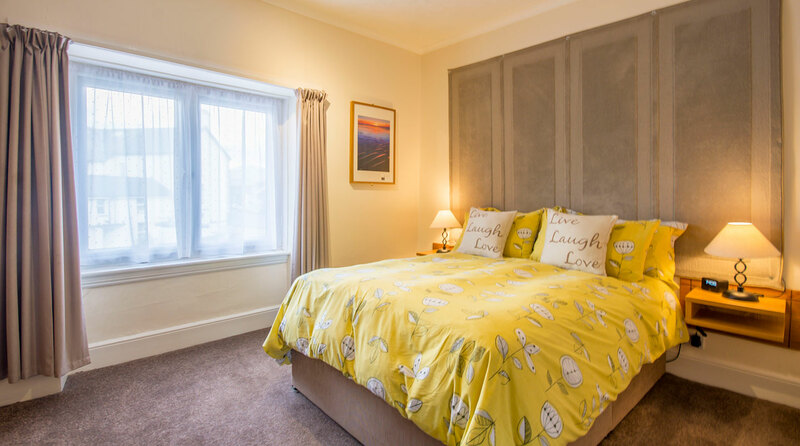 However, why not consider our large twin room, which is located on the ground floor and gives you all the benefits of a standard twin room but with less challenging access plus additional space and a lovely bay window seat? If you choose this option, please note, that our breakfast room is located on the lower ground floor, so 1 flight of stairs would still have to be negotiated unless you go via the alternative route (better known as fresh Welsh air before breakfast route) into the dining room which avoids the staircase. In any case, we are always here to help with advice and a strong pair of hands when it comes to assisting you with your luggage on arrival and departure. If you are craving space and style, our 2 large double rooms are just the thing for you! Both are located on the first floor. In the distance, and without having to stand on your tiptoes, you can see Moel Hebog near Beddgelert. We thought we throw in some Welsh vowels here for you to get your tongue around, so you can start practicing before your visit. 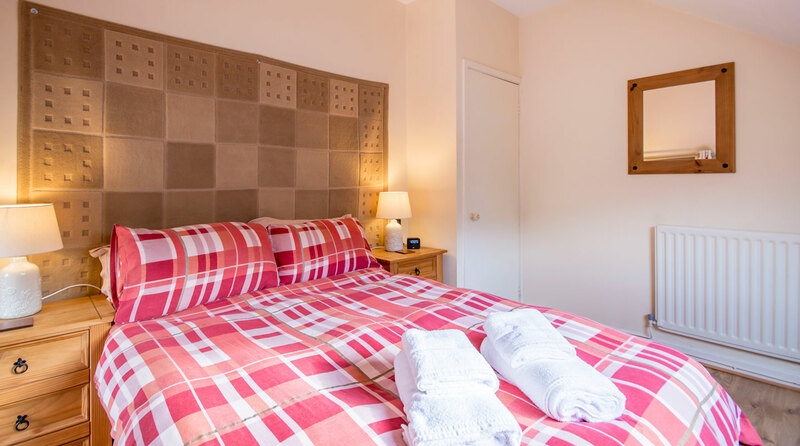 Our large double rooms feature a somewhat bolder (but not too daring) colour scheme and plenty of room to relax in. If we were wine experts, we would say they are as fresh as a field of daffodils with a hint of apple blossom and undertones of a gentle Welsh summer breeze. So there you have it! Our large twin room is special in that there is only one of its kind here at Tudor Lodge! 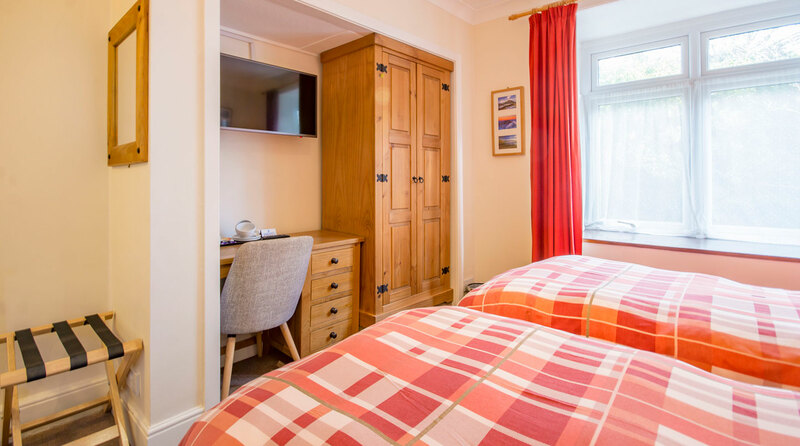 It is conveniently located on the ground floor, so is perfect for guests who prefer a room with twin beds, extra space, a lovely bay window seat and all of this with the added benefit of not having to climb up onto the first floor. If preferred, the two single beds can be pushed together creating a large 6ft (approximately 1.82m) wide bed. Take a look at our delicious breakfasts.